We have finally played a game with Loriel (my Tomb Kings opponent from the game I posted recently) where he used his High Elves. If you haven't done that already you absolutely must read his fantastic High Magic article where he describes his approach to that lore and how it influences his army list building as well as tactics on the battle field. I would like to take the opportunity to thank Loriel for his patience as due to real life interference I again had to postpone the game we planned initially. Fortunately, he was kind enough to find another date for me and that game took place! Two sworn-hosts of Ellyrian Reavers were patrolling the coast while the main army of the Outcasts marched from the desert after recent encounters with the undead armies of Tomb Kings. It was refreshing to feel the sea breeze and both riders and steeds were invigorated by it. Suddenly swift Elven cavalry stopped and the warriors looked towards the horizon. White and silver sails with blue runic signs were clearly visible in the distance. Not an armada but enough ships to carry a full host of one of the noble houses. "House Loriel sails to war", said the leader of the Reaveres , "They sent House Loriel against us this time." "How do we know they are hostile? ", asked another warrior with a bit of hope in his voice. "They always are", grizzled veteran replied. Warriors observed approaching ships in silence, counting them and assessing possible strength of their kin. "Why did they send House Loriel though? I thought that among them all they are the most friendly towards us?" "Oh, that's simple" replied the leader with crooked smile, "they send the ones that actually didn't scorn us but studied us the most". The reavers turned around knowing their kin spotted them already and raced back towards the army. There will be few time to form towards the battle. We agreed with Loriel to come up with some kind of background to link our previous game where he commanded Tomb Kings to this one. I will leave it to Loriel to explain his part of the story :) As before we are going to post the report in stages so that Loriel can add his feedback and comments about each turn. We are, of course, very interested in your take on the evolving situation so don't hesitate and tell us what you think! 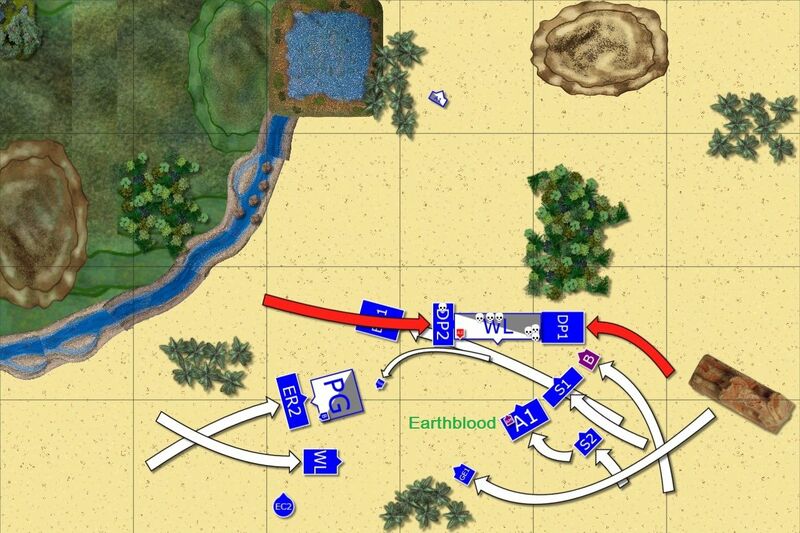 As you can see this is the army that is based and constructed on a totally different philosophy to mine. It is, as Loriel stated in his article, build around High Magic. Please, bear in mind we played closed lists so while I knew from Loriel's previous reports what to expect in general I didn't know if he took the same magic items. It turns out not necessarily. I am sure he will explain his choices in more details later so I will just say that +3A on the Annointed and Banner of Swiftness were added specifically against my army. He also mentioned he was considering taking Swordmasters instead of Lions for this match up but in the end decided not to tweak his army too much. I expected to have a very tough nut to crack. Loriel's Lions would most likely be accompanied with Anointed and Archmage. It means they already have 6++ and any magic phase will improve it fast. They are very well protected against magic with BotWD and against shooting with 3+ armor save and any ward save they would end up with. Their already considerable potential can be further improved with spells. They are stubborn and hit hard with 3 ranks so it will be a suicide to hit them from the front. On top of that the presence of Anointed makes them Immune to Psychology so these guys are not going to go anywhere. Second big block of Phoenix Guard is also well protected. With BSB and his ring then can potentially get 3++ ward save too. Depending on the situation they should be able to receive some magical support too. Silver Helms and Phoenix form hard hitting units on their own although in comparison to Lions and Phoenix Guard they seem to be less tough. But they are very fast and if any of infantry block is also moved with the spell then I can have these hard hitters extremely close and hard to avoid. Support in the form of reavers and archers is not to be ignored. I may have advantage in the shooting but these bows and long bows will hurt my small units regardless. High Magic will play crucial role this game. With BoH it will reliable influence the battle so my aim is to pick a spell to dispel per phase and try to overcome the rest with my own actions instead. Priority would be walk between worlds. Movement is, for me, the most crucial phase and I will need to limit my opponents maneuverability. Soul Quench is potentially very dangerous but I assume to lose some regiments to it. It is acceptable to a degree because there are no bolt throwers that could cripple my army if used in addition to powerful magic missiles. Having said that, to have 2 of these per magic phase is not desirable. My plan was kind of similar to what I tried to use against big blocks. Kill support (reavers, archers) fast to have better movement control. I thought I could deal with SH but with some sacrifices. Phoenix will be a problem so at least delay it and try some lucky charges with cavalry. Delay and divert PG and WL as long as possible and try to give up as few points in the process as possible. However, I also wanted to try and tackle one of these two blocks at least but to do that I needed overwhelming odds and blocked other elements of Loriel's army so that I can actually grind the enemy down. It is possible when I attack from 2 directions at the same time (preferably both flanks), hold in enemy turn and then add more push again from few directions. My army list was exactly the same as against Loriel when he played with his Tomb Kings. 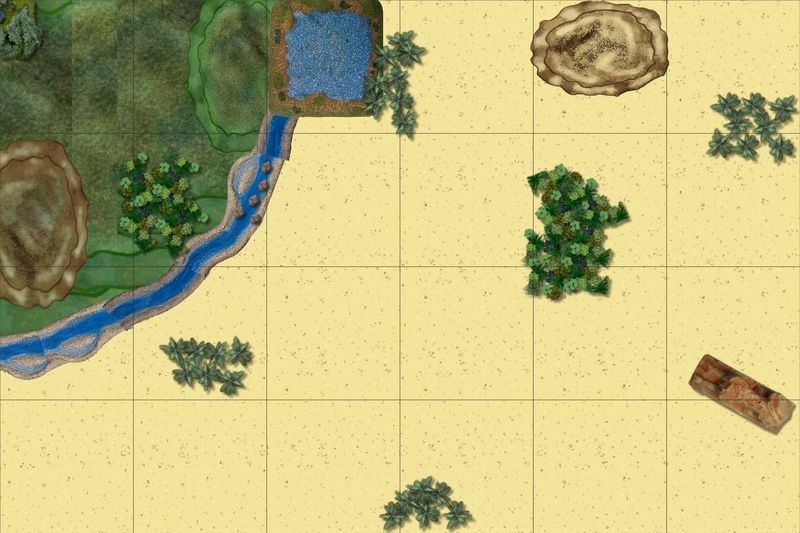 I tried to recreate a nice map we had on UB that represented a desert and a delta of a river close to the coast of the sea. I know it is not smooth enough but it was the best I could achieve quickly. I hope you will forgive me crude "drawing". The hills are only in brown colors. We agreed there are two passages through the rivers that don't affect the units in any way. However, any water (delta including) and forests are mysterious. Sphinx is impassable and blocks line of sight. Same with hills and even if you are on the hill you cannot see to the other side of the hill or sphinx. Loriel won the roll off to pick the sides and chose North. He did that for background reasons but I think it was better choice regardless. He then won the roll off to start deploying. But I was the first to move my vanguards. It happened that the forest where Archers hoped to find protection turned out to be a Venomous one so any move would result in dangerous terrain tests. Loriel won the roll off thanks to +1 bonus and proceeded to his first turn. High Elves from House Loriel moved fast to take advantage of the situation. 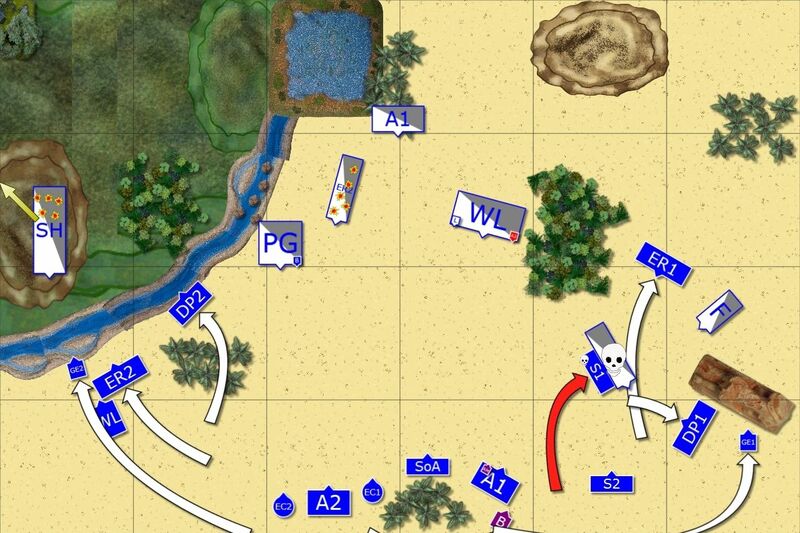 Their opponent deployed defensively and was clearly trying to buy time either in the vain hope for negotiations or to catch a breath after long march through the desert. Outcasts enemies picked their battle field well and the timing even better. Expected magical barrage came with strong winds of magic harnessed with expert practice. Larry the Loremaster focused on a single spell his adversary was weaving and used all his might to dispel the one that was about to teleport White Lions closer to his army. Fortunately for him the following magic missile didn't do as much as damage as expected but Lions were nicely protected by a double layer of Shield of Saphery. Finally, the Archers focused on Sister of Avelorn as their only target and Outcasts elite troops suffered first casualties. Despite visible tiredness Outcasts attacked without delay. The enemy attempted double pincer maneuver so it was important to not only stall it but counter charge as fast as possible. 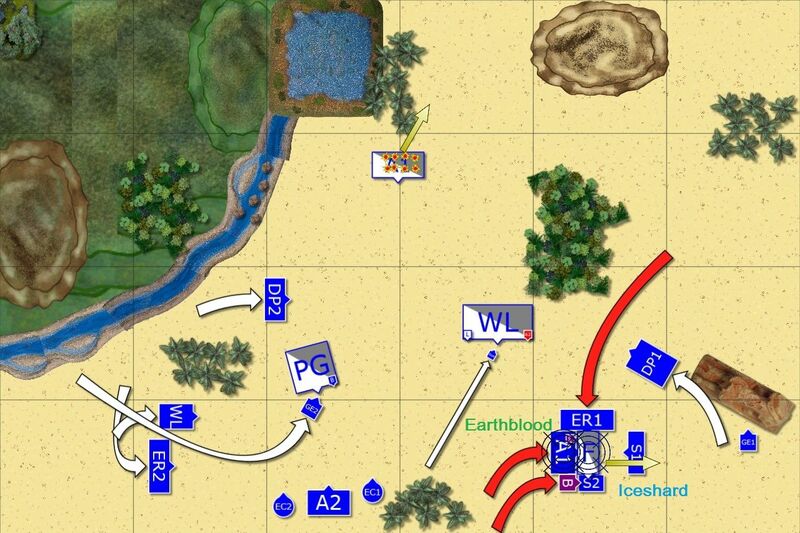 On the right flank the Swordmasters charged Reavers who exposed their flank and since enemy fast horse didn't flee, warriors of Hoeth didn't give them much of a chance to fight back. Swordmasters tried to use momentum to reach the Phoenix but they were too slow. At the same time the nearby units regrouped and got ready to receive Phoenix attack. On the left flank the regiments moved to avoid Phoenix Guard and at the same time surround Silver Helms with fast troops fleeing if attacked and Lions and Dragon Princes ready to counter. However, before they could do that Eagle Claw crews aimed at enemy knights and released the multiple bolts that penetrated armor as if it was not there. That heavy blow panicked young knights of House Loriel and they fled the battle! 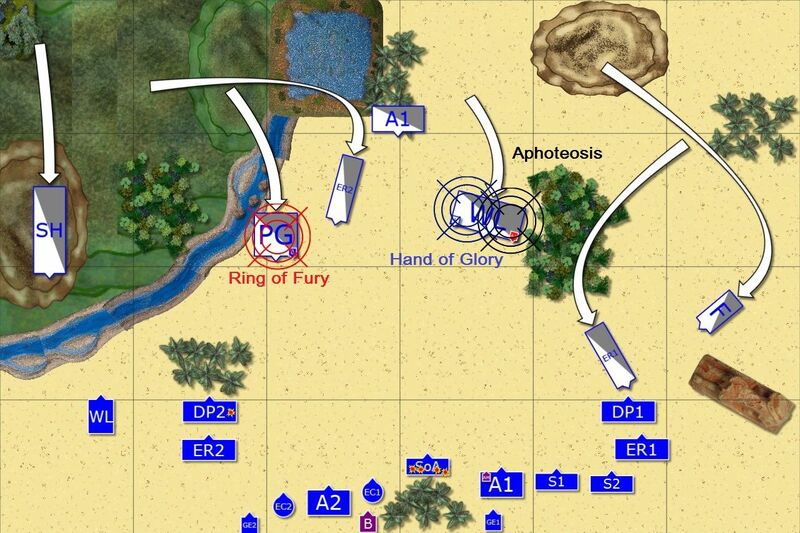 Following the example, Sisters and Archers aimed at exposed enemy fast cavalry and wiped them out. In a powerful combination of ranged and close combat attacks, Outcasts managed to get rid of all three cavalry units of the House Loriel giving them a good advantage already. Despite the losses House Loriel pushed hard. 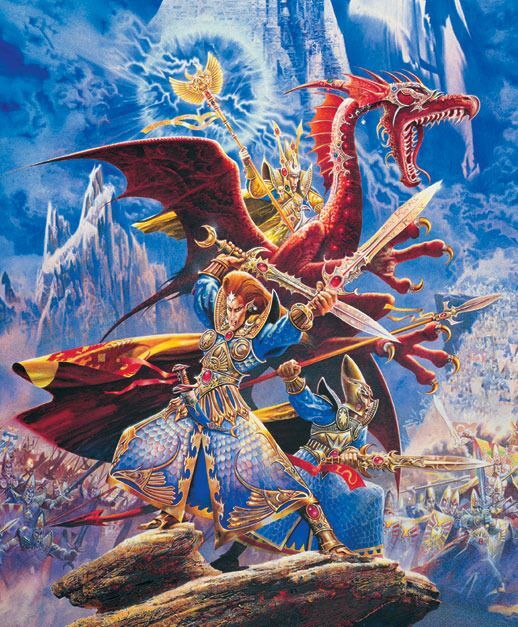 Lions charged enemy Swordmasters who wisely retreated but it didn't slow down rampaging warriors as their Archmage aided them with the magical ability to move further and faster than naturally possible. The Phoenix used the momentary disorder among the Outcasts ranks to charge the second unit of Swordmasters and warriors of Hoeth tried hard to hold fast. Fortunately for them, there were enough of them remaining to do so and the help was on its way. On the other flank Phoenix Guard moved towards their adversaries fast and their battle standard bearer used his magical ring too. With the aid of Archers the casualties among Sisters were huge and only their leader survived. Outcasts where hard pressed so in order to reclaim the initiative they had to push back harder. 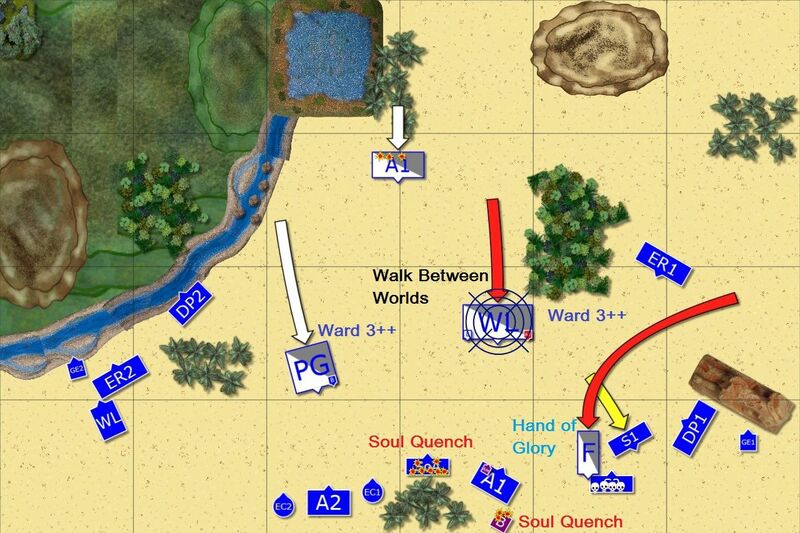 Sensing the opportunity, Larry the Loremaster and Bob the BSB gave the order to attack the Phoenix with all available units. It was very risky fight and lone Sister took it for the team to buy them more time to press against the Frostheart if it held the ground. Sheer power of the attack was great but to further tip the balance of the fight to Outcasts favor, Larry shrouded his unit in protective bubble, healed griffon a little and froze the Frosheart beyond the point that even that Phoenix can comfortably withstand. It is still extremely resilient opponent and out of multitudes of attacks only a few wound. The Phoenix, however, is overwhelmed byt the swarming Elves and does not hit back strong enough, breaks and is run down in pursuit. Only Larry and Archers do not run after the Frostheart, Outcasts wanted to be sure it does not escape. On the other flank great eagle delayed Phoenix Guard while shooters opened at enemy Archers. They suffered lots of casualties and panicked not to rally until the end of the battle. With only two main regiments left and both blocked, House Loriel leaders had to come up with a better idea of how to catch elusive Outcasts. Phoenix Guard got rid of the annoying eagle but didn't change the facing and were still attacking towards the South. White Lions attempted a complex reform maneuver that didn't work as well as planned ([i]Edit: Loriel planned the swift reform and shuffle to the right but failed his Ld9 test to d so[/i]). It was not going well but magic could still save the day. Unfortunately, this time the Loremaster was ready and dispelled the attempt to make a magical teleportation. The Archmage took more energy to Soul Quench the crew of the Eagle Claw and this time the Loremaster was not able to prevent that. As a result the war machine was destroyed and nearby Archers had to withdraw from the battle. However, the feedback depleted the Archmage of his energy completely and no other spells were cast. Seeing the opportunity to pin White Lions down, both units of Dragon Princes charged in and both made it. The rest of the army maneuvered to form second wave of the attack and only Reavers moved to block Pheonix Guard from attacking anybody else. The winds of magic were super strong this time but Archmage dispelled all but two spells anyway. Larry the Loremaster managed to heal his friend Bob and dueled enemy BSB to mind war but could not penetrate mental armor of his adversary just yet. Dragon Princes use the charge momentum to push hard against Lions and while on the left flank they created good distraction, the unit on the right managed to capture the enemy Archmage. With such an important hostage in their hands, Outcasts gave the chance to the enemy to withdraw and negotiate terms of their surrender. Seeing the reason behind that offer, Anointed ordered his remaining troops to withdraw, while the Archmage was taken away for difficult negotiation talks. Outcasts were all assembled in an unusual formation. Not for battle but for inspection of an allied force commander. It was surprising even more because the honors were for recently defeated and captured Archmage of House Loriel. The negotiations came to an end, honor guard of the enemy was invited to the Outcasts camp to make sure the wizard gets back to his army safe. The Archmage moved slowly and took the last look at the army he thought he knew how to defeat. He didn't show any sign of emotions and he didn't share his thoughts with the commander of the honor guard. He gave his word and now it was the time to withdraw and set sail back to Ulthuan. "They will be back. ", said Bob the Battle Standard Bearer, his eyes always focused on enemy warriors, his kin or not. "Yes, it is just a matter of time. ", replied Larry the Loremaster. "They will be harder to defeat next time. ", continued Bob. "Yes, indeed. ", agreed Larry without a trace of doubt. "Why do we let them go then? ", asked grizzled veteran of the Outcasts, although he knew the answer already. "Because Ulthuan needs hardened warriors to defend her from her true enemies", said the general. "You are naive to think the Loremasters in White Tower will thank us for forging these warriors for them, Larry", added grimly the Battle Standard Bearer. "It does not matter, my friend, we don't fight for them either", said warrior of Hoeth, and turned towards his lieutenants. Time to march again, to fight against real enemies. After the last combat where Loriel lost his Archmage (I managed to inflict 3 wounds and Loriel didn't save any on his 5++ ward) he decided to call it a game. I understand the decision, as without magical protection and many units heading towards the Lions this unit was doomed. They had few attacks to the flanks, Anointed had only S4 and no re-rolls either so it would not be easy to get rid of Dragon Princes now. In subsequent turn Archers, Swordmasters and BSB could all storm in again. It was also late hour so i didn't push Loriel to play a little longer either. However, I am curious how long would it take to tackle Lions and if I had enough time to try and attack PG too. I really hoped to demonstrate that my army has tools to dismantle powerful blocks as well. It is kind of funny that my recent opponents, Darth, Galharen, EB and now Loriel, all threw the towel before the game finished. As I said, I totally understand why a player might want to do so but at the same time I feel something is missing. In all these games I had a tough nut to crack so when I finally got upper hand I could not show to the fullest the potential of the army. And it seems to me that the reader might get an impression that I won with shooting and magic alone, while I know that positioning and using the opportunities to surround the enemy as well as openings given, were very important. So again, this is not a rant or disappointment but kind of funny thing that happened to me recently. I think several factors contributed to my victory this time. 1. 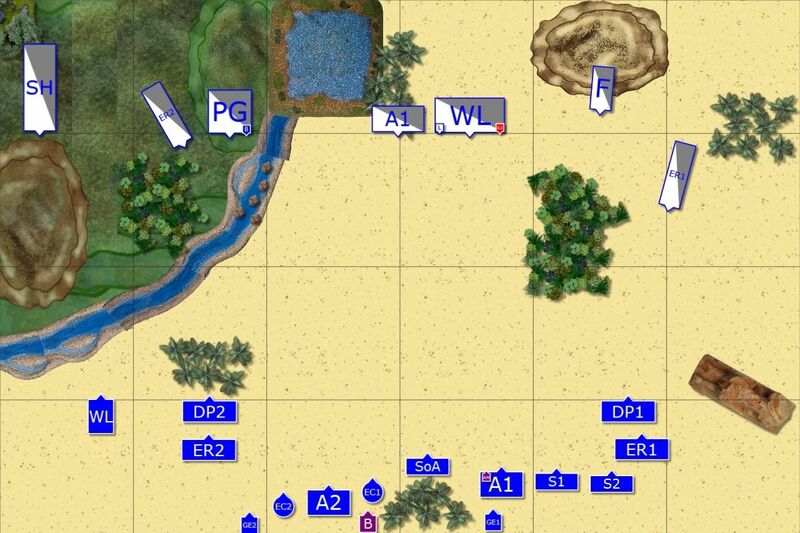 Deployment - Loriel decided to deploy his army wide but that resulted in the battle line that consisted of individual units rather than the army. Many of these could not be engaged from the front but by separating them Loriel gave me the opportunity to isolate them and attack from both flanks. What is more, no unit apart from PG benefited from BSB re-rolls which happened to be crucial in so many occasions. For example, loss of Silver Helms is one but the Swift reform where the Archmage in Lions could not reach BSB to finish him with Soul Quench is another one. 2. Approaching piecemeal - Loriel moved his forces as individual units and that also cost him. In particular, Reavers were lost without good reason and when I got 3 cavalry units in one turn his chances to avoid out maneuvering were greatly depleted. The charge of the Phoenix was premature and with such a massive static combat result it also showed that such a powerful unit can be taken down by swarm of troops. 3. "Unlucky" magic phase - it was a great opportunity when I managed to stop Loriel's Walk Between World spells and when on top of that his Archmage got irresistible force. It meant I had a chance to attack him when he had "only" 5++ ward save. Thanks to that and despite his Fencer's blade I still had enough attacks to attempt killing him in a single combat that actually worked! From that moment he could not protect his Lions anymore. I hope you still found the report interesting!